Dahlia, Hyacinth, Daylily and Echinacea. 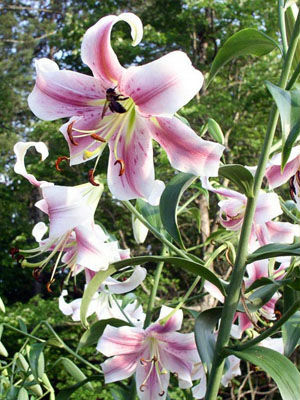 Tall Oriental lilies make regal plants for the back of a mixed border. Smaller Asiatic lilies grow to only 90cm (36in) tall and work well as feature plants that bloom in early summer. Use small mound-forming annuals like lobelia, portulaca, or sweet alyssum to hide the bare bases of lilies.